Looking for a cute, cozy escape for 2? Look no further! 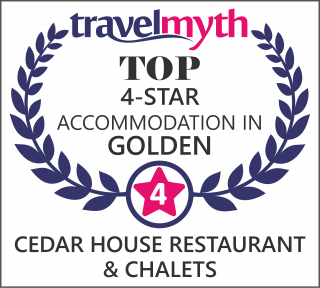 The Cedar Chalet has a great central location close to the Cedar House Restaurant and backs on to the well manicured gardens. Equipped with a full kitchen, ensuite bathroom, WIFI and laundry facilities, The chalet offers all the comforts of home during your mountain escape. With a luxurious queen size bed in a private bed room and queen sofa bed in the living area this chalet can host up to 4 adults. The living area houses an iPod docking station, Flat screen TV with cable, DVD player, Dvds, games and wood burning stove. The Cedar Chalet also features a private deck with BBQ and hot tub. This guest house has the option to be wheelchair assisted with a minimum of 2 weeks notice. *We accept dogs under 50lbs for a fee of $35 per pet/night up to a total of $140 per pet for 4 or more nights. Designated chalets only, for other pets or larger dogs please call us prior to booking. “We cant thank you enough for the most amazing 4 days we have ever spent on a vacation. The Cedar Chalet was so comfy and inviting. The décor was fabulous. We hate leaving here. Its like a home away from home but quieter. So peaceful & mystifying. Thank you again Darrin for the air conditioner. It was very nice of you to care about your guests comfort especially in a heat wave. The food at the restaurant was nothing less then amazing. Gordon Ramsey would be proud. The staff here are absolutely wonderful and always go above and beyond. We cant wait to come back. Even our dogs were so relaxed.” -Denise, Chris, Mopit & Coco.